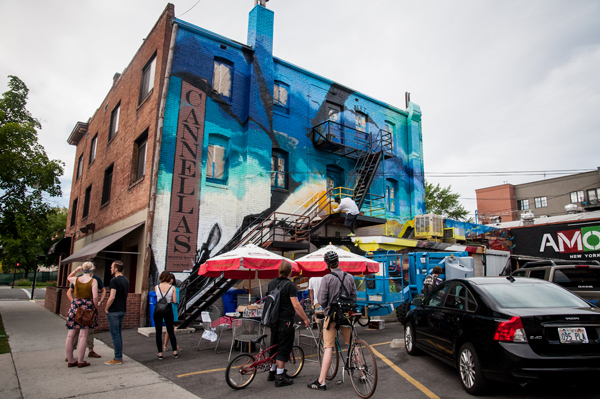 To celebrate their 35th anniversary Cannella’s, the Salt Lake City restaurant devoted to good food and good times, has unleashed artist Ben Wiemeyer on the south side wall of their building. Founded in 1978 by Joe and Missy Cannella on the corner of 500 South and 200 East, Cannella’s offers up great Italian food at affordable prices right in the heart of the city. In 2007 they added a bar and lounge, bringing an eclectic bar scene into the warmth of a cozy family business. The recent addition of AMORE, a gelato and pizza slice shop directly to the east, means the restaurant has food and treats for every ocassion. While the brick of their building that faces the street is an elegant brownstone, the backside is a dull gray paint. Or was. Ben Wiemeyer, with a fortnight off from his gig at The Leonardo after installing their current exhibit 101 Inventions, has been working the past week to cover the backside — brick, fire escape, ducts, chimney and anything else that gets in his way — with his fiery graffiti style. When you come to the Utah Arts Festival this weekend, be sure to make your way to it via 200 East, where you’ll see Wiemeyer’s bold creation and probably catch him at work. One of the most exciting things at the festival this year may be happening just outside its gates. 15 Bytes photographer Caitlin Blue has been one of the many admirers watching the wall progress and sent us this slideshow of images.